Soldier of Fortune struck out for infamy at the onset, and retrospectively, it’s one of the few that maintained that over the many years. “Starring” former real-life mercenary John Mullins, SoF offers 27 levels of hard and fast paramilitary action. It has a wide selection of weapons, inventory items including grenades and plastic explosives, and a storyline full of intrigue as you track down four nuclear weapons stolen by the enigmatic terrorist organization known as The Order. You’ll conduct night operations, day operations, assault a subway, palace, oil refinery, and a moving train with your buddy Hawke lending support and the booming voice of Michael Clark Duncan. Ultimately, none of this matters. 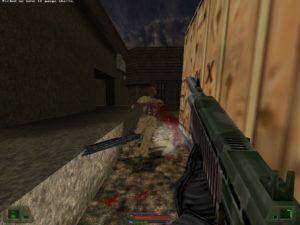 Soldier of Fortune will always be known as the game where you shoot people in 20-something “dismemberment zones” and watch their pain-wracked bodies bleed out from shattered limbs in a unique way for each spot. 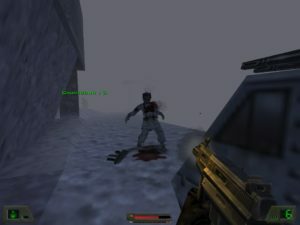 Now “pain skins” had been around since Quake II, where an enemy’s texture got swapped out with a bloody/damaged version after a few hits. SoF includes these as well, but further adds deformation to what were historically static models. Limbs can be removed. Small triangular polys can get added to suggest exit wounds, so a blown-out hole can be simulated on the back of an enemy’s head or torso. Sprites stick out of severed limbs to suggest a ragged edge and bloody pulp. Polygonal intestines can poke out of gutshots to varying degrees (though they never spill onto the floor). 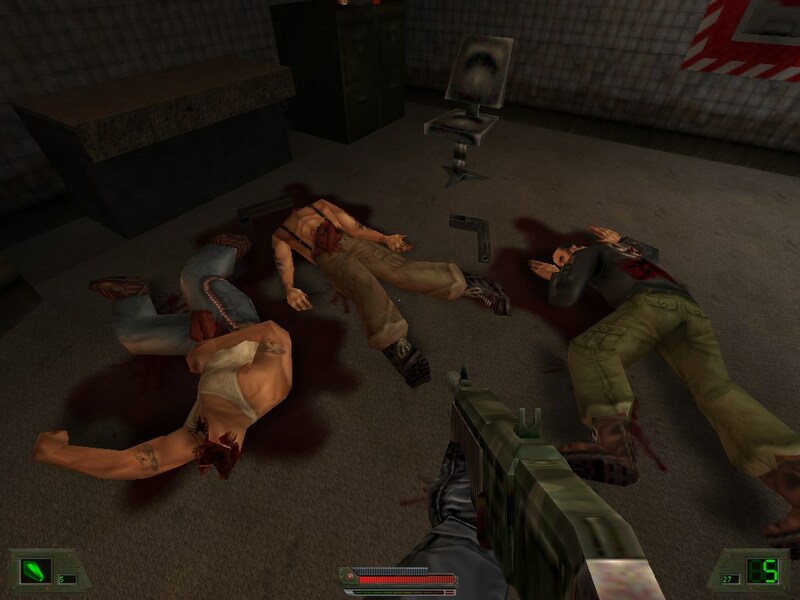 And various shapes of blood textures splatter on the walls and floor in real-time, to further sell the carnage. 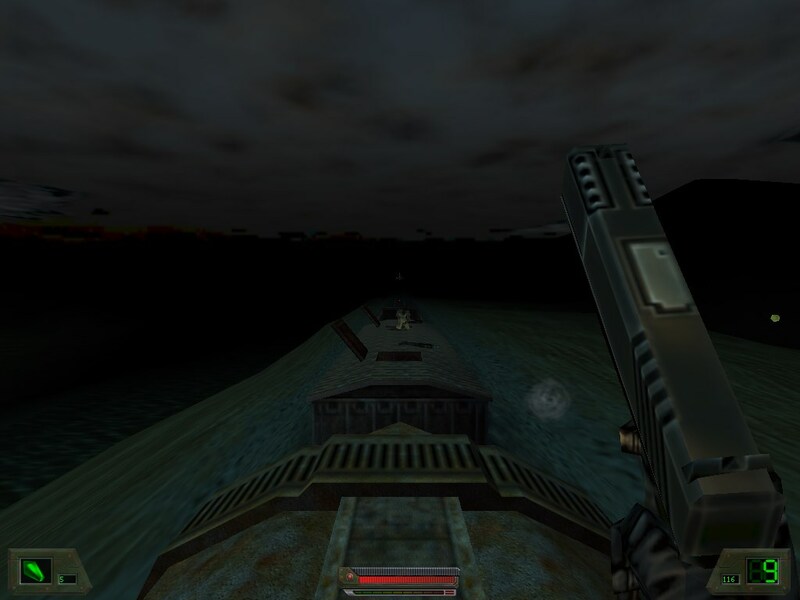 All of this is generated on the fly by the custom GHOUL enhancements to the Quake II engine. 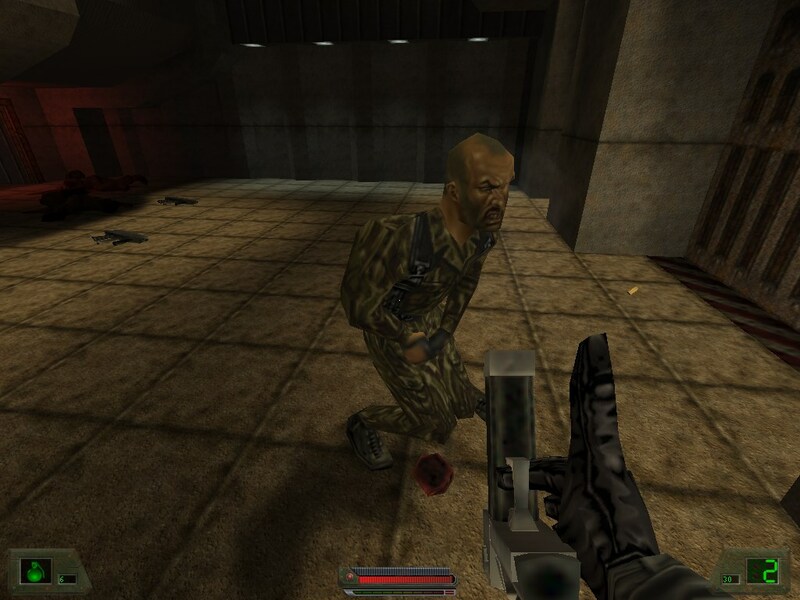 Stock animations still provide the tumbles enemies take after defeat, but now they may do them with a missing head or profusely bleeding stump, or writhe around on the floor in pain after a less than lethal blast. It also allows parts of models to be swapped out from a pool of premades, giving enemies some variety in terms of hats, masks, and faces. The most impressive effects don’t involve extreme gore – the action movie blood puffs look fantastic. Is there a point to all this? I think so. Gamers were excited because, after being used to technical limitations that made enemies take a shotgun blast to the face and simply fall backward in the same way as the last fifty guys, any form of variety ’twas welcome. Sure, you’re going to get the crowd that gets a little too excited because you can now break up a dead body into component parts and stringy bits, but I think the real achievement here comes from being an incremental step to making the action more dynamic, and less like a stiff, polygon cartoon show. Weapons have consequences, and the action has effects. Not to say this game was never out to garner free marketing through controversy with that gore, because there’s simply no way that it wasn’t. GHOUL’s effects seem comical at times – the simple act of firing a shotgun in a bad guy’s general direction causes limbs to pop off torsos like uncapping snakes-in-a-can. You can allegedly shoot a gun from an enemy’s hand, but any high-power weapon is likely to take that arm off with it. You can empty entire clips into enemies and watch them spaz around like Jimmy Caan in The Godfather. You can shoot enemies in the nuts, because of course you can. And an unscripted moment for me saw a hostage’s face literally blown off while screaming for her kids. It’s hard to justify enjoying this gore in any intellectual way, we can only hope to argue that it doesn’t really affect us. 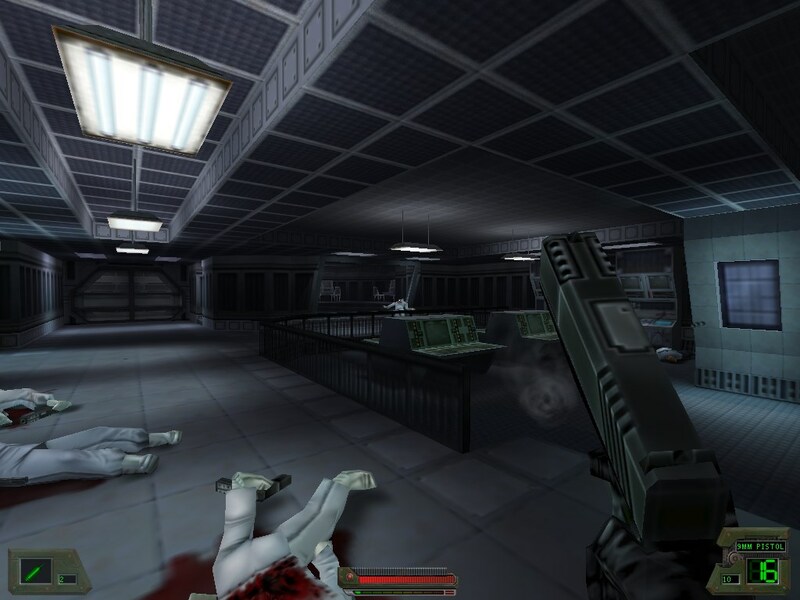 This is where SoF’s infamy starts to get in its own way – in all the talk about GHOUL, the actual gameplay gets lost, and what’s here is actually a pretty excellent shooter in the vein of the most ’80s of Hollywood cinema. Mullins runs around as a gunslinging lawman with his Charles Bronson mustache and floppy swamp hat. The plot takes you around the globe, and into such politically incorrect hotspots as Serbia, Iraq, and the Sudan. Weapons are based off of realistic counterparts, up to and including a belt-fed machine gun that allows you to go full Rambo. There’s variety in the sights and settings, including New York subways, elaborate underground labs, and Tokyo skyscrapers. It certainly checks all the action game boxes. There are six premade difficulty settings, or a custom option that lets you determine limits on quicksaves, enemy toughness, spawn rates, and how many weapons you can carry into each mission. 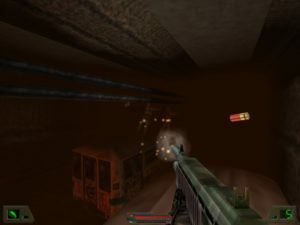 At the “normal” difficulty, enemies are astonishingly inaccurate, unable to hit you from a few feet away with a stream of SMG fire, and bullets sting like mere mosquitoes. Only emplaced guns will cause you any particular spikes of damage. On the next level up, “challenging,” snipers call you up before you roll out of bed and shoot you over the phone. So while the adjustable difficulty settings are nice in theory, in practice, there’s not enough balance or options after all. You can beat normal with one eye open, a hangover, and someone else holding the mouse, while challenging and higher are only tolerable with extremely frequent quicksaves. Other than the gore, graphics retain the patented Quake II engine look. Boxy architecture, some fairly hammy explosions, decent lighting, a pretty cool fog effect, and lots and lots of brown metal. Some nice texture work in the labs and Tokyo helps the various spots on your world tour look diverse, but areas like the African slaughterhouse and New York tunnels look like areas from the Strogg homeworld. There are also a fair amount of scripted events with deforming buildings and exploding objects, and more than a few exciting battles with nearly invulnerable helicopters and tanks. You’ll also run across some shiny textures here and there, especially on the guns, whose models suggest loving care in their craftsmanship. They’re loosely based on real-life counterparts, but do contain enough moving parts and smooth angles to avoid being simple blocks with fire textures coming out of the end. The pistol’s slide travels back as it shoots, the Uzi’s bolt handle clatters back and forth, and the SMG has a windowed clip with a bullet texture that “feeds” into the gun as you shoot. Half the guns feature extra secondary fire modes (like grenade launchers, or throwing knives), and two dedicated keys trigger superfluous animations for most weapons – having John flip his shotgun in the air, switch the hand his pistol is carried in, or wipe blood off his knife. The occasional action sequence has you doing something like riding atop a subway car, but they’re over in seconds. Average, but quality, effects await you in the sound department. Enemy voices are usually only grunts and screams, but when they do talk, they will do so in the language of the current region. Mullins (Todd Susman) and Hawke duel back and forth for Most Gravelly Action Hero Voice, and you’ll get a lion’s share of ridiculous action movie lines as you progress (my favorite: “Kill me and you’re a dead man.”) Gunshots boom when they need to, and even the smallest weapons convey power and believable reports. Music is thumping action, with a dynamic feature to switch between ambiance and action movie moment depending on the situation. This works well, and even retains a unique theme for each level and location. Sound also plays a limited role in the game itself, with a meter along the bottom that tracks your stealthiness. It has nothing to do with movement or actual noisemaking, as only gunshots make it rise. The idea is that once it hits the red area, the game will spawn more enemies to attack you. In practice, it doesn’t matter at all as only large, prolonged gun battles between you and multiple foes cause the meter to reach this point. Each weapon has a cap to the ammo you can hold, so you’ll need to pick up dropped guns, but I never, ever got close to totally running out. There’s no stealth missions that end the level if you alert someone, or the like. 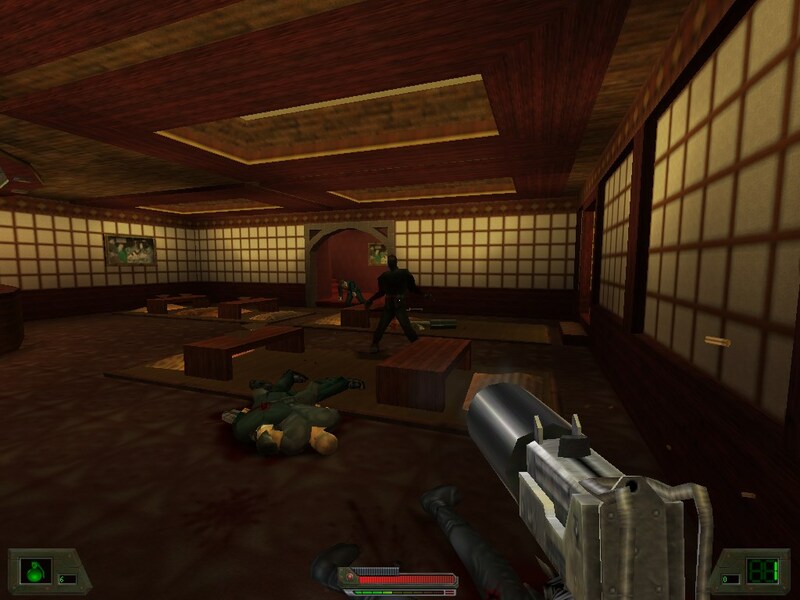 Soldier of Fortune’s legacy is the outlandish gore, which never looked particularly realistic – and looks downright primitive today. Still, it’s a bit of a shame that the GHOUL system overshadowed everything else about the game. It’s one of the the most true-to-film action games I’ve played, and it really nails the moments when you’re running through complexes and blasting at ineffective guards. The plot is almost too dumb to enjoy even ironically, and even with all its options it’s tough to set the difficulty level to your liking, but the rest can be good fun. If you don’t like the offer of shattered limbs and protruding guts, turn the parental controls on and enjoy an otherwise intense interactive B-movie. 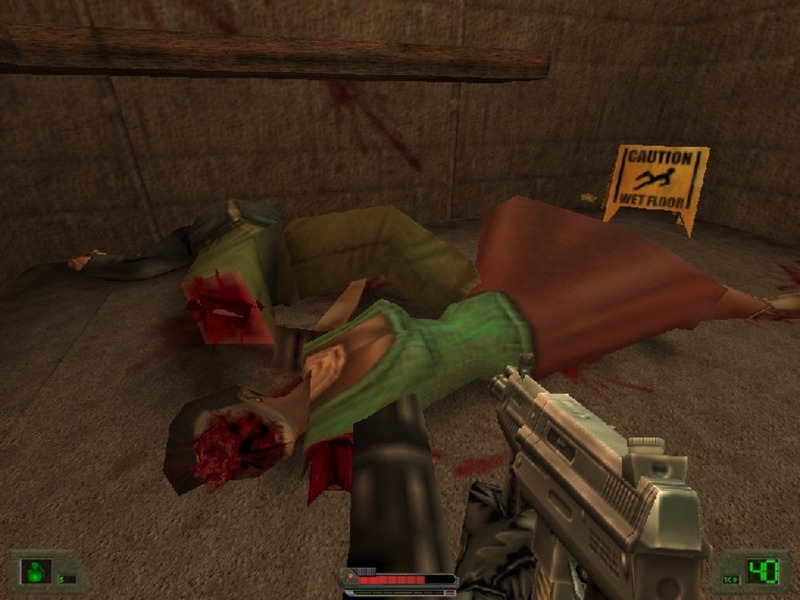 The gore doesn’t make the game better per se, but it doesn’t get in the way of another fine FPS title. Some of the gore, like the excellent blood puffs, actually help it feel more like playing an action film instead of just another game with blocky, brainless characters. Gore sometimes goes too far, but there’s parental controls with multiple options. Loads of difficulty options, but quite a disparity between settings for damage or A.I. reactions – mostly rely on it to turn off quicksaves. Variety in the locations, but not so much in the action – just shoot bad guys and find the switch.